Swapna has been known her whole life for her energy and tenacity. Born in India without a fibula bone, she was adopted from an orphanage by a Beverly, Mass. family. Due to a prenatal medical condition, Swapna was born with a partial left foot. After undergoing 18 surgeries in the first 9 years of her life, Swapna had her left foot amputated above the ankle in 2014. 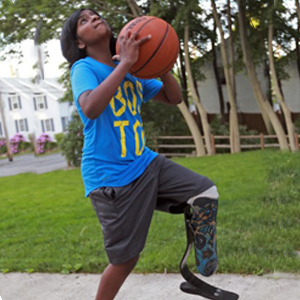 An avid basketball player, Swapna often played on a prosthetic leg that was not suited to the high levels of activity she exhibits during games. She broke 3 walking prosthetics and was often more easily worn out using the heavier, uncomfortable leg. She needed a customized prosthetic that her insurance would not cover – meaning it was simply out of reach for her family. Enter the students of Blake Middle School in Medfield, MA. After reading The Running Dream by Wendelin Van Draanen, a book about a young runner who tragically becomes an amputee, the kids were inspired to raise money to help HAF get the funds needed to get Swapna the right prosthetic. They raised money throughout the year, holding car washes and bake sales and other fundraisers, and with the help of HAF, Ossur, Challenged Athletes and a Step Ahead Prosthetics, Swapna is now flying up and down the court on her new blades!